Spring and summer wedding season is underway... 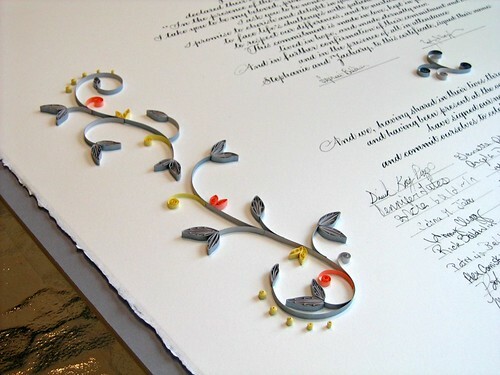 I've been busy creating quilled marriage certificates and ketubahs. I enjoy the process, especially when presented with the opportunity to work with a new color palette. Even if the requested design is similar to one I've done in the past, just working with different colors makes it feel fresh again. 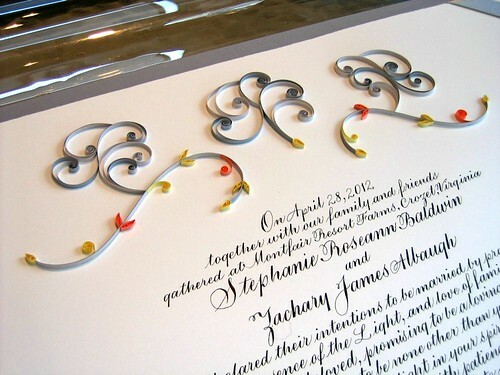 Steph and Zach were married a year ago in April and asked that I add the quilling in time for their first anniversary. Such a nice paper-themed gift to give one another, plus it provides me the opportunity to show the look of a certificate with signatures in place. The wedding colors were gray and yellow with a touch of coral - very pretty and understated. Rather than S scrolls on each side as I often do, they requested linear scrollwork. Riva Brown of Living Letters Studio did the calligraphy. On a completely different note, I needed a card for a male friend's birthday party recently and found this one in my stash that I'd made while in a Celtic phase. The federal blue/olive green color scheme and non-frilly design were just right for the recipient. Seeing it again reminded me that I don't especially enjoy doing symmetrical quilling, but I do like using Paplin's two tone strips. They give an interesting look because the paper is color-printed, thus coil edges appear white, not typical of most quilling paper. Right now I'd better get back to a certificate I've been working on this week for a July wedding. It's a completely new design and involves a paper sculpture camellia. They are such beautiful flowers, the pressure is on to do them justice! 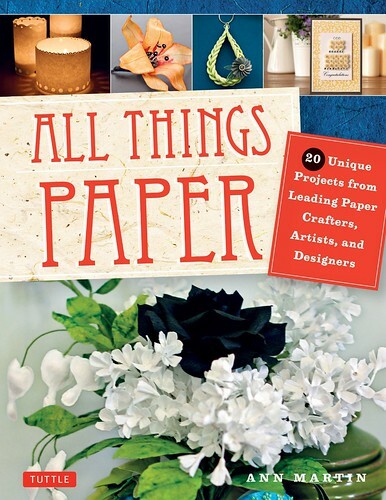 One last thing for today... the Look Inside feature has been enabled for the All Things Paper book. Take a sneak peek! Release day for print and Kindle versions is coming up on June 11th. Stay tuned for some fun book-related happenings around here and have a great weekend! beautiful certificate and lovely card !!!!! all your work is gorgeous! I am glad you shared the card. I have a pack of the Paplin two-tone mix. As I write, it is still sealed. Now that I saw the strips in action, I doubt it will stay sealed for long. Enjoy those new papers... the colors are subtle, but sometimes subtle is nice. Ann, these are gorgeous! I love seeing your quill work. Such a pleasure to see your quilling Ann. Pretty swirls and colours. 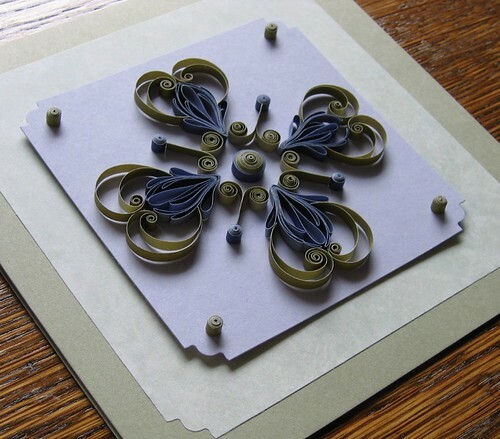 I love your card, So neat and symmetrical and such a pretty design too. Wonderful certificate!!!! Your book cover looks enticing!!! I so enjoy receiving your blog....TFS! You're a perfectionist as always! Congrats on your book! You're well read and on top of all of the trends--it'll be a great resource for everyone! I can never get enough of looking at your beautiful crafts-womanship, Ann. Love how the bride has gotten you to use colors we don't normally reach for because the bright colors add the touch of lighter whimsy and really state their personalities. Thanks Cecelia! I love it when brides lead me to new color combinations. 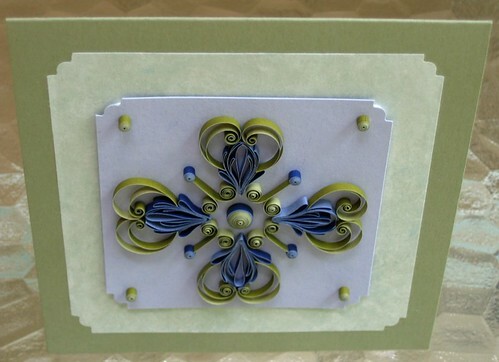 I love seeing your quilling projects. Thanks for sharing. It's fun to revisit the past and see what you used to do and how you've grown and changed. And how exciting to see your future dreams coming true like the book project. Good luck with those flowers. Thanks Cheryl, it was a ton of work (at least a million mouse clicks, I like to say!) but so enjoyable at the same time.